ATS Euromaster stock a wide range of premium tyres at fantastic prices on Michelin, Continental, Dunlop, Goodyear, Pirelli and Bridgestone tyres. All tyre prices include fitting, valve, balance and disposal of old tyres. 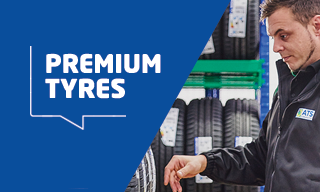 Premium tyres go the extra mile to ensure that your car handles and performs at its best. Premium car tyre brands often test the tyres in the most stringent conditions and integrate the best technology, engineering and material to develop tyres to provide the best driving experience and performance. Premium car tyres are produced from high grade material to ensure that they are more resistant to wear and tear to last longer and provide optimum safety. In addition to the material and tyre testing, premium tyres often provide improved wet grip, fuel efficiency and lower noise levels when compared to cheaper tyres. If you have a high annual mileage, travel on motorways or at high speed regularly, then premium tyres are for you. These tyres are designed for demanding driving styles and are better at withstanding rougher terrain. Most importantly, they are designed to make safety paramount. Your tyres are the only thing between your car and the road, if you need to make an emergency stop or manoeuvre quickly then they are ideal for gripping the roads surface. If you want your tyres to withstand varying weather conditions and have the best performance, then premium tyres are the best choice. Popular premium tyres include the Michelin Pilot Sport 4, Michelin CrossClimate, Pirelli P Zero, Continental Premium Contact and the Dunlop SP Sport.